But this time around my old pal John Agnello joined us from day one as co-producer and engineer. And we also have a bunch of tour dates coming up - headlining shows in the US this May, over in Italy in June and the rest of Europe in October. 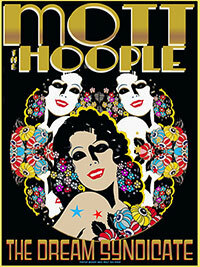 Oh, and we got asked to open 4 shows in April for Mott the Hoople. We’re quite excited. Mark Walton saw them the last time they toured the US. In 1974! With Queen as the opening band! Hope we make it to your town. But, if not, maybe you can "put some miles on" and join us on the road. In the meantime, enjoy the videos - directed by David Dalglish. They’ll take you on a trip without traveling.